At Queen’s, we’re very proud to have Dr. Heather Stuart on faculty as the Bell Chair in Mental Health and Anti-Stigma Research. So, all of us in the Faculty of Health Sciences were especially thrilled when we received the news of the major honours that she has received this past year. In September, she was inducted into the Royal Society of Canada, and in December it was announced that she had been appointed to the Order of Canada. These are both amazing accomplishments, and I am thrilled for Dr. Stuart, as she is incredibly deserving of these honours. I knew I wanted to draw attention to Dr. Stuart’s recent successes on the blog, and there’s no better time to do so than January 30th: Bell Let’s Talk Day. It’s become a tradition for me to cover Dr. Stuart’s work and the broader work being done by the Bell Let’s Talk campaign every year on Bell Let’s Talk Day, and now more than ever it seems appropriate. I want to start by talking about the video that I’ve posted above. When Dr. Stuart was inducted into the Royal Society of Canada, our Faculty of Health Sciences communications team made a video of her that was played during the gathering of the Society in Halifax in October. I hope that you will watch it because in it Dr. Stuart tells us a bit about her background and what inspired her to pursue anti-stigma research. As Dr. Stuart explains, her mother was an administrator at a mental health institution, and her family actually lived on the grounds of the hospital. As a result, the residents of the institution were Dr. Stuart’s neighbours when she was growing up. It was only when she got older that she realized that there was a stigma against the mental health patients who made up her community. I hope that you find Dr. Stuart’s story and message as inspiring as I do. The work that she does on mental health and stigma reduction is so important, and I think that she and the Bell Let's Talk campaign are creating real changes in how Canadians think about and discuss mental health. 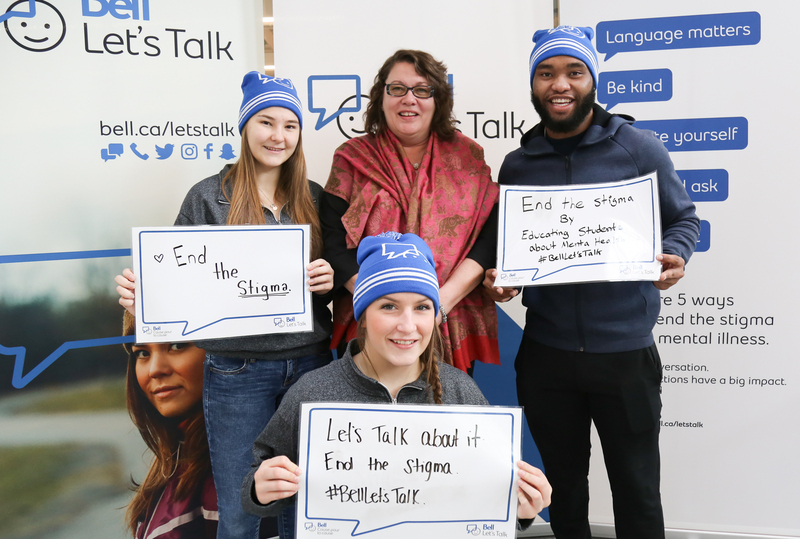 Over the past year, Bell Let’s Talk has been putting a greater emphasis on the prevention of mental illness, especially among post-secondary students. Along with the Rossy Family Foundation, RBC Foundation, Bell Let’s Talk has been funding the Post-Secondary Students Standard project that is being developed by the Mental Health Commission of Canada (MHCC) and the Canadian Standards Association. Dr. Stuart is playing an important role in this project, as she serves on both the executive committee and the evaluation committee. She also led the research team that developed the literature review on the mental health of post-secondary students. A summary of that report is available on the MHCC website. The goal of this project is to come up with a voluntary guideline that can help academic institutions in Canada promote and support and the mental health and safety of post-secondary students. We’re becoming increasingly aware of the fact that post-secondary students are at risk of developing mental health problems, and these guidelines will be an important step in keeping students healthy and safe throughout their education. Along similar lines, at Queen’s we’re proactively trying to improve the wellness of our students by being mindful of our campus environment. Environment plays a huge role in wellness, and Queen’s has agreed to join the Okanagan Charter. The charter calls on post-secondary institutions to make wellness a key aspect of campus culture. Upon joining the Okanagan Charter, Queen’s has committed to developing a system-wide framework to support wellness on campus, and also to advance research and teaching on health promotion. To encourage students to take a leadership role in how we approach campus wellness, we organized an event that put their ideas and experiences at the forefront. In the past, Queen’s has often organized a large public lecture to draw attention to Bell Let’s Talk Day, but this year we went in a different direction. On Tuesday January 22nd, Queen’s hosted an event that enabled students to come together to have a dialogue about mental health. Dr. Stuart led a group of panelists who shared their thoughts on, and experiences with mental health in a campus setting. The atmosphere of the event was so welcoming and supportive that a number of students in the audience felt comfortable sharing their own personal experiences of dealing with mental health issues while at Queen’s. Events like this are so encouraging, because it shows that the efforts of the Bell Let’s Talk Campaign are working. People across Canada are becoming increasingly aware of mental health issues and are working against stigma more proactively. It’s hard to imagine previous generations of students being as comfortable discussing their mental health experiences in a public forum as the students at last Tuesday’s event were. So please join me in celebrating Dr. Stuart’s anti-stigma work today, Bell Let’s Talk Day. Please, have open and honest conversations about mental health with the people you care about and help make a difference by reducing the stigma against mental health issues. As a helpful starter, keep Bell’s 5 ways to help in mind: choose your words carefully, educate yourself, be kind, listen and ask, and talk about mental illness. As a final note, I want to draw your attention to an upcoming initiative in the Queen’s School of Medicine. In the next few months, we will be conducting a survey of the medical school community on the topic of wellness. In our current strategic plan, we set the goal of creating a culture of wellness in the School of Medicine, and in order to achieve that goal we first have to assess our needs. The survey that will go around is going to be an important tool in conducting that needs assessment, so I hope that all medical faculty, residents, and students participate. With everyone’s help, I am confident that we’ll create an outstanding culture of wellness at Queen’s. Thank you to Andrew Willson for his assistance in preparing this blog. The Bell Chair in Mental Health and Anti-Stigma Research will provide enhanced opportunities to mentor undergraduate, graduate and postgraduate trainees and to provide highly qualified personnel required for the mental health anti-stigma sector in Canada.